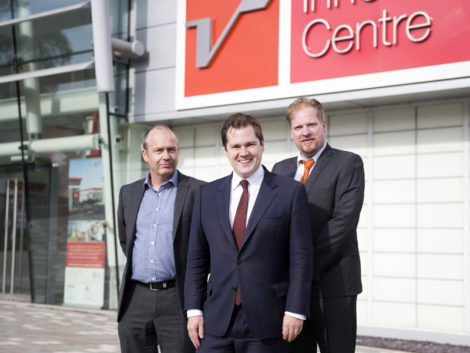 Robert Jenrick MP, Exchequer Secretary to HM Treasury, believes businesses in the Silverstone Technology Cluster have an important role to play in the development of the Cambridge-Milton Keynes-Oxford (CMKO) growth corridor. Robert met with STC CEO Pim van Baarsen and Board member Rob Lewis (MD, TotalSim) during a visit to business estate Silverstone Park. The estate is also represented on the STC Board (its Commercial Director Roz Bird is STC Chair) and is where TotalSim is now developing a new world class sports engineering hub and Swedish company Uniti has announced it will build a futuristic, fully digitalised production plant for its electric car, the One. Explaining the purpose of his visit, Robert commented: “I wanted to see first-hand the vast potential for growth in the Cambridge-Milton Keynes-Oxford Arc. Attracting business and innovation to the Arc will be fundamental to its success and prosperity. “Silverstone Park has already secured Enterprise Zone status and is on the way to establishing itself as a global destination for engineering, innovation and business development. He continued: “There is clearly some great work going on at the Park and in the Cluster. For example, Rob’s business, TotalSim, has gone from strength to strength and he has plans to expand further. “The Silverstone brand, the benefits of the Cluster network and the facilities on site at the Park are all factors that have benefited TotalSim. Robert’s comments echoed those of Milton Keynes South MP Iain Stewart who sits on the House of Commons’ Transport Committee and has highlighted the STC as being an important player in the CMKO corridor’s future.